A little more than a year ago, while examining a newly made ALFALFA grid, Riccardo noticed a rather bright source in the constellation of Leo, moving away from us with a velocity of only 264 km/sec. It was not (or only barely) resolved by ALFA’s 4 arcminute beam, and its HI line velocity width was very narrow, indicating either a fully face-on and/or a very low mass object. In fact, it met the criteria of a “ultra compact high velocity cloud”, the targets for which Betsey Adams has been hunting. With such a low redshift, it was not clear whether the signal arose from a cloud in the Milky Way’s halo or a previously unidentified, tiny nearby galaxy. Quick checks of the public Sloan Digital Sky Survey (SDSS) and Digital Sky Survey (DSS) images showed no obvious associated stellar population but a suggestion of some faint, blue-ish emission. Could this really be a very faint, very small Milky Way neighbor, a bona fide (almost) optically-invisible (dark) galaxy? We needed to determine its distance and to look for evidence of rotation (which would suggest the presence of dark matter), so the quest to obtain the required additional observations began. Being able to respond quickly to potentially exciting discoveries is one of the reasons ALFALFA is a team effort. So right away, we contacted ALFALFA team members Kathy Rhode and John Salzer at Indiana University, because IU has access to good imaging instruments on the WIYN (Wisconsin-Indiana-Yale-NOAO) 3.5 meter telescope in Arizona, and John Cannon at Macalester College who has been undertaking the SHIELD (Survey of HI in Extremely Low mass Dwarfs) program with the VLA. We made a special plea to the director of the VLA for “director’s discretionary time” to take a quick peek at the HI source to look for rotation. Knowing us not to ask without good reason, the director approved our last minute request. 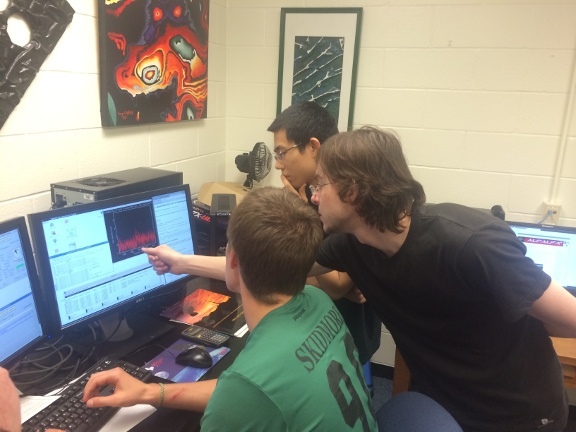 Although we were sure of the reality of the signal, the (awesome) Undergraduate ALFALFA team, during one of the ALFALFA followup runs took a spectrum centered on the optical object to confirm the position and radio characteristics of the ALFALFA signal. Kathy and John S. were able to take some quick images during an already-scheduled observing run. Indeed there were stars, and even more importantly, not very many! And a single HII region, proving that star formation is taking place. The VLA observations were made a few months later and the map that John C. and his student Elijah Bernstein-Cooper (read Elijah’s comments in an earlier post) resolved and localized the HI gas and confirmed that the object is rotating. Rotation signifies the presence of a significant amount of dark matter proving its extragalactic nature. A truly tiny object, Leo P contains only a few hundred thousand stars, in contrast to the Milky Way’s tens of billions, but Kathy and John were able to tease out an H-R diagram of the stars, yielding a distance of about 1.75 Mpc (or 5 million light years). So, while Leo P meets Betsey’s criteria to be an ultra compact high velocity cloud, it is also a bona fide galaxy, discovered because of its hydrogen gas, not its starlight. In fact, it contains more mass in gas than in stars. Most recent spectroscopic observations made by another ALFALFA team member Evan Skillman of the University of Minnesota confirm its pristine nature as an object that has undergone very little enrichment in heavy elements due to nucleosynthesis in stars, earning it the designation “P” for “pristine”. We believe that Leo P has managed to retain its gas without forming stars because, in contrast to most dwarf galaxies which reside near large ones, it lives virtually isolated in the local universe, just outside the Local Group. Leo P is the first example of the class of gas-bearing tiny galaxy for which ALFALFA was specifically designed to look. Betsey’s thesis has already produced a catalog of similar “dark galaxy” candidates even though the survey data processing is not yet complete. 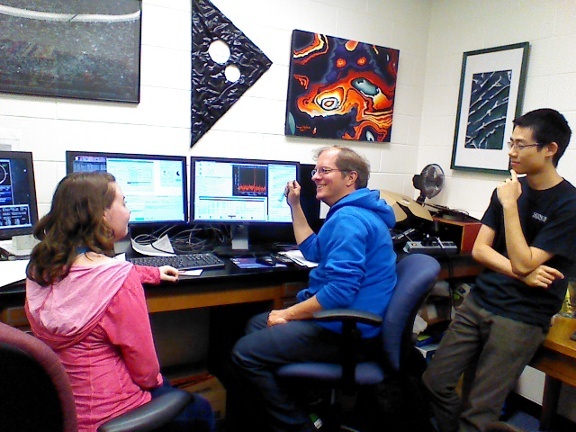 As in the case of Leo P, we are pursuing the required detailed observations of the very best candidates (see her post on her March 2013 observing run at WIYN with its new pODI camera). 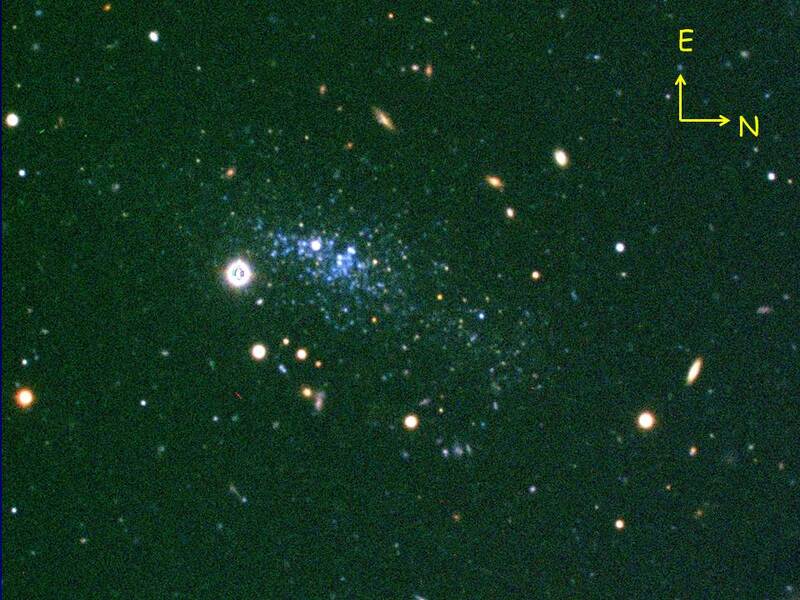 The ALFALFA hunt for (almost) dark galaxies continues, but now we have shown that they do exist and that we can find them! This post was written by Andrés Arrieta, a student at the University of Puerto Rico at Rio Piedras during his first observing experience as a member of the Undergraduate ALFALFA team. The excitement I felt as I arrived to the Arecibo Observatory was belittled by the growing excitement that I would come to feel with every minute that I spent learning, conversing and investigating the universe throughout the weekend. Every person I met had something beautiful to teach me in all aspects, not only astronomy. 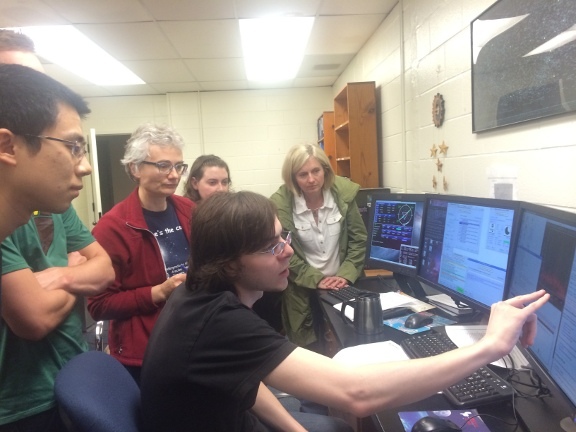 I learned about the process of identifying galaxies by interpreting the data produced by the telescope. Also, I learned about the process by which the telescope gathers that data, which involves a period in which it is on source and then a period in which it is off source, which will be subtracted to produce a final result. After this process, one interprets this information and decides whether there is enough evidence to say that the source is a galaxy (also using the SDSS optical information as an aid in our identifications). Overall, it was a great experience; everyone I met during my stay was nice and very willing to answer questions and have enthralling conversations about diverse topics. It is was wonderful to be given the opportunity to spend a weekend doing something I love and getting to know people that fuel the love for science with their presence and knowledge. I cannot wait to do it again! 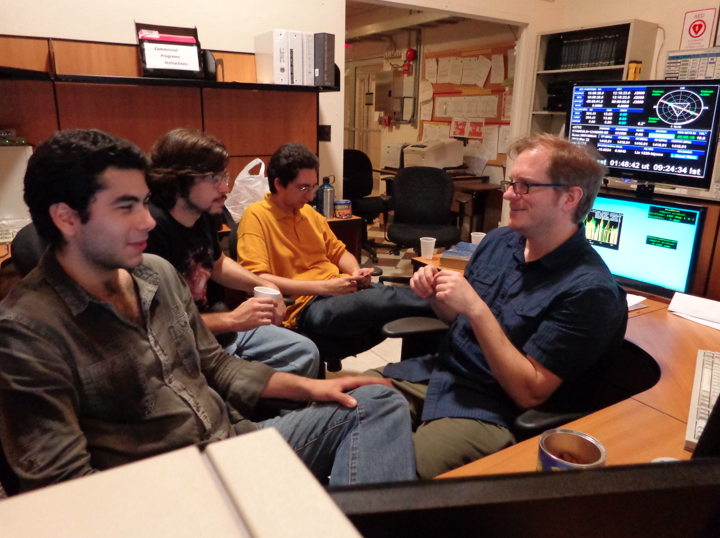 The following blog post was written by Catherine Weigel, an undergraduate at Hartwick College and member of the Undergraduate ALFALFA Team (UAT), during our annual workshop at Arecibo Observatory. The January 2012 UAT workshop has been a great experience in seeing the progression of science. As the ALFALFA survey is finishing up, we are starting to observe using the L-band wide (LBW) detector. The great part in doing this workshop is that we actually got to spend time observing in which we learned how these follow up observations would work. The really cool part about it is and what is different from the ALFALFA survey’s data collection is that we are able to look at the data we just collected and see how it looks, right away figuring out if there is a source or not. Though a lot of the sources were not detections, there were quite a handful that were. Now the next step is taking those sources and figuring out what they could be and how to verify it. I find that having gained many experiences through the UAT project and having been a part of the team for a few years that this progression into the follow up study is really quite a fantastic process and a great experience to see. We are really seeing how history is made, how science finds a cause and pursues it and this is an important feature to see. Especially since one of the greatest things about science is finding a project that you see has the potential of gaining knowledge and understanding to the basic nature of the universe. The only way to find the answers is to pursue a way to make the project become a part of the reality of research. The UAT Workshop has been an exceptional trip. We have learned quite a bit, and it is fantastic that the professors and the observatory share this experience with us. As a student, I feel as though this is a great contribution to my understanding of the scientific process and the scientific community, opening my window of knowledge to the field. This contribution was written by Martha Haynes during the 5th annual Undergraduate ALFALFA team workshop at Arecibo Jan 16-19 2012 when we conducted a first set of observations designed to explore the most interesting candidate signals without optical counterparts. Despite what people might think, our annual trips to Arecibo in January are not spent lying on the beach under a palm tree. We work hard… and sleep little! In addition to full days devoted to lectures and activities centered on radio astronomy and ALFALFA science plus interesting topics presented by Patrick Taylor (“Planetary Radar Astronomy”), Ellen Howell (“The Geology of Puerto Rico”) and Julia Deneva (“Pulsars”) of the Arecibo staff, plus the great tours of the platform (thanks to Dana again!) and the dish itself, we also have conducted 3 nights of observing. Everyone on the UAT has had a chance to participate in the observations for an hour or so on two different nights, so all of us now are a bit sleep deprived. Cornell ALFALFA grad students Greg and Betsey led the observing runs from midnight until 7am. Unfortunately, there was a power failure before the end of the run on the 3rd morning, so we lost a little time. But, observing on these three nights has given us the change to test and finalize our observing strategy so that we could write up our documentation and develop some routines to schedule, log and undertake quick checks of data quality. And, furthermore, we also have confirmed the reality of some of the “dark galaxy” HI signals, candidate detections found in the main ALFALFA dataset but without any evidence of a stellar counterpart. These 3 nights are just the first part of a more extensive program we hope to conduct later this spring, and over the next few years. But even with this short run, we have taken a first significant step forward. By making these “follow-up” observations, we have eliminated any possibility of man-made radio interference as the source of the apparent HI signal. Next we will have to go use other telescopes to look harder at the positions where we detect the HI signal for associated starlight, but now we know where to look: the hunt for “dark galaxies” is ready to continue!!! Dreaming about the Future: What science will come after ALFALFA? As we wind up 2011 with about 95% of the ALFALFA survey observations completed, we are already starting actively to think about what science we want to do when we have finished the ALFALFA survey. That of course won’t be for some time; we won’t get the final observations until Fall 2012, and then we will still have to process and analyze the data to produce the final ALFALFA legacy catalog. But, already, we can imagine starting a new survey in a few years, and as was the case with ALFALFA itself, advanced planning (and a bit of dreaming) is critical to pushing the frontiers of science forward. What science do we want to do and what observational and computational capabilities will be required in order to achieve that science? What new instrumentation might be available in a few years? In the last few months, we’ve been thinking seriously about what will come after ALFALFA. One of the science frontier questions related to “Understanding the Cosmic Order” identified in the Astro 2010 decadal survey asks how baryons cycle in and out of galaxies. A number of papers have shown that dark matter halos of mass below log Mtot/Msun < 10 are baryon-poor. Studying the process(es) which impose this depletion requires advances in (g)astrophysics (reionization, feedback, etc) and better observational constraints on the baryon content of low mass dwarfs. ALFALFA has discovered a set of ultracompact HI clouds which might be associated with low mass dark matter halos in the Local Group, but determining their distances and thus proving their extragalactic nature by detecting their associated stellar counterparts is very difficult. We realize that the clinching evidence that the lowest HI mass clouds are in fact the cores of isolated low mass dark matter halos will require a deep census of several very nearby groups of galaxies. At distances of 5-10 Mpc, low HI mass dwarfs will separate in velocity from the range of galactic and perigalactic phenomena, thereby allowing a direct estimate of distance without requiring the detection of stellar counterparts. Besides exploring the baryon content of low mass halos, an accurate counting of such dwarfs in nearby groups may potentially constrain dark matter decay models (decay injects kinetic energy that can unbind dwarfs). A survey with 10 times ALFALFA’s sensitivity covering several hundred square degrees in 2-3 nearby groups would deliver the required sampling. To undertake such a survey with ALFA and its 7 feed horns would, however, take an enormous amount of telescope time. We need more pixels! The exciting news is that a 40-beam focal plane phased array feed (PAF) is now in development. A PAF on a single dish can be cooled, and Arecibo’s unmatched instantaneous sensitivity is optimal for local universe detection experiments. So, besides working on ALFALFA in the next years, we will also start the advanced planning for a new survey with this new device dubbed “AO40”, perhaps to start in 2014. You can read more about our thinking on this survey here. We started the advanced planning for ALFALFA in 2002, and the survey observations themselves began in 2005. So it seems about the right time to start laying the foundations for the next generation survey. Dreaming about the future is always fun, especially when you realize that the future isn’t so far away. I’m going to do some bragging for Ann and Sabrina here. They both have had papers recently accepted to astronomical journals for publication (and Sabrina’s has been published online already because I’m a little slow), which means they posted these papers to the astro-ph arXiv. The arXiv is an online preprint server where scientists post their papers before publication so that the community can see exciting results as soon as possible. Ann‘s paper is a presentation of a catalog of sources from the ALFALFA survey. Ann took a strip of the survey area and found all the sources – both galaxies and high velocity clouds. This work is part of the legacy aspect of the survey. The catalog is made available to the community so that people can use the information about the hydrogen content of that part of the sky in future scientific work.